US President Donald Trump had an active Wednesday on Twitter, which included retweeting a meme suggesting Deputy Attorney General Rod Rosenstein committed treason. Trump’s relationship with Rosenstein has been a subject of great speculation given his ire over the deputy attorney general’s role in appointing Mueller to run the Russia investigation. The meme also included other well-known figures associated with either the investigation into Russian election interference or the Democratic Party, such as special counsel Robert Mueller and former President Barack Obama. 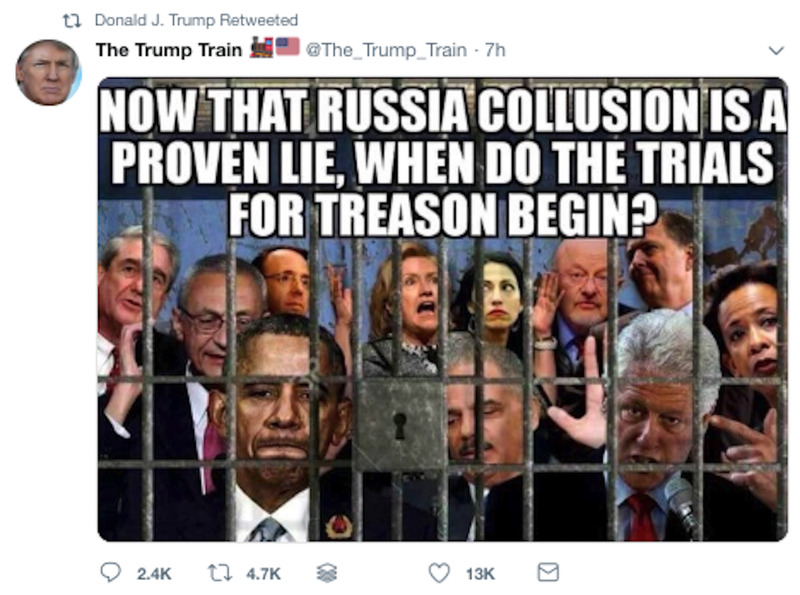 It essentially calls for Trump’s political opponents to be tried for treason, and by retweeting it the president seemingly offered his tacit endorsement. The meme incorrectly suggests that “Russia collusion is a proven lie.” There is not currently any definitive proof the Trump campaign colluded with Russia, but there’s also an ongoing investigation into the matter. The president recently elevated Matthew Whitaker – who served as chief of staff to former Attorney General Jeff Sessions – to acting attorney general. In the process, Trump controversially bypassed Rosenstein.